The FMI specifications are available from here. A short overview on FMUs and the FMI specification can be found here. The FMU SDK can also serve as starting point for developing applications that create or process FMUs. For each of the supported FMI versions (currently 1.0 and 2.0), the FMU SDK contains the C sources for various discrete and continuous FMU models, a batch file for compiling and zip'ing these models, an XML parser for parsing the model description of an FMU and two simple simulation programs that run a given FMU and output the result as CSV file. The FMU SDK 2.0.6 can be downloaded from http://www.qtronic.de/doc/fmusdk.zip. For bug reports, questions or comments regarding the FMU SDK, please mail to fmu@qtronic.de. Questions or comments regarding the FMU specification should be sent to info@functional-mockup-interface.org. The FMU SDK runs on all 32 bit and 64 bit Windows platforms, Linux and Mac OS X platforms. Download the FMU SDK from here, and unzip the file in a directory where you have write access. That directory is called FMUSDK_HOME below and may contain white space, such as in "C:\Program Files\fmusdk". The FMU SDK contains only the C sources of the FMUs and the simulators, not the executables, and should compile on all Windows, Linux and Mac OS X platforms. To build Windows 32 bit versions of all FMUs and simulators of the FMU SDK, double click on FMUSDK_HOME\install.bat. This should create fmus in FMUSDK_HOME\fmu10\fmu and FMUSDK_HOME\fmu20\fmu, as well as four simulators in FMUSDK_HOME\fmu10\bin and FMUSDK_HOME\fmu20\bin. To build Windows 64 bit versions of all FMUs and simulators, open a command shell and run "install -win64". This creates additional fmus in the x64 subdirectories in FMUSDK_HOME\fmu10\fmu and FMUSDK_HOME\fmu20\fmu, as well as additional simulators in FMUSDK_HOME\fmu10\bin\x64 and FMUSDK_HOME\fmu20\bin\x64. Building these 64 bit versions works also on 32 bit Windows platforms. Execution of the 64 bit simulators and fmus requires however a 64 bit version of Windows. Compilation using install.bat requires that you have installed one of Microsoft Visual Studio 2005 (VS8), 2008 (VS9), 2010 (VS10), 2012 (VS11), 2013 (VS12) or 2015 (VS14), for example the free Express Edition. To compile with another compiler, adapt the batch files. To build Linux or Mac OS X binaries of all FMUs and simulators, open command shell and run "make". The build requires that you have installed the C and C++ compilers, libexpat and libxml2 libraries. To install these dependencies on Linux you can use a package manager like "sudo apt install g++", "sudo apt install libexpat1-dev", "sudo apt install libxml2-dev". This unzips the given FMU, parses the contained modelDescription.xml file, simulates the FMU from t=0 to t=tEnd, and writes the solution to file 'result.csv'. The file is written in CSV format (comma-separated values), using ';' to separate columns and using ',' instead of '.' as decimal dot to print floating-point numbers. To change the result file format, use the 'csv separator' option. The logging option activates logging of the simulated FMU. The FMI specification does not specify, what exactly to log in this case. However, when logging is switched on, the sample FMUs of the FMU SDK log every single FMU function call. Moreover, the fmusim simulators log every step and every event that is detected. On Linux and Mac OS X get inspired by run_all target inside FMUSDK_HOME\makefile. To plot the result file, open it e.g. in a spread-sheet program, such as Miscrosoft Excel or OpenOffice Calc. 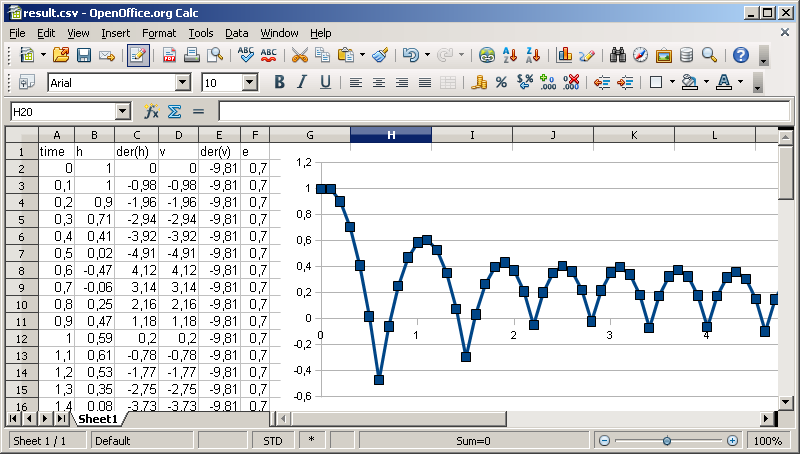 The figure below shows the result of the above simulation when plotted using OpenOffice Calc 3.0. Note that the height h of the bouncing ball as computed by fmusim becomes negative at the contact points, while the true solution of the FMU does actually not contain negative height values. This is not a limitation of the FMU, but of fmusim_me, which does not attempt to locate the exact time of state events. To improve this, either reduce the step size or add your own procedure for state-event location to fmusim_me. To implement your own FMU using the FMU SDK, create a directory - say xy - in FMUSDK_HOME\fmu10\src\models, or FMUSDK_HOME\fmu20\src\models, and create files xy.c there. The name of the new directory and of the .c file must be the same. The content of the .c file should follow the existing FMU examples, see the comments in the example code. For FMI 1.0, add also file modelDescription.xml. The XML file must not contain the <implementation> element and the closing <fmiModelDescription> tag, because this is added automatically during build. For FMI 2.0, add file modelDescription_cs.xml and modelDescription_me.xml. When done with editing xy.c and the xml file (or files), open a command shell in FMUSDK_HOME\fmu10\src\models or in FMUSDK_HOME\fmu20\src\models to run the build command. On Windows, run command build_fmu me xy to build an FMU for model-exchange, or build_fmu cs xy to build an FMU for co-simulation. This should create a 32 bit FMU file xy.fmu in the corresponding subdirectory of FMUSDK_HOME\fmu10 or FMUSDK_HOME\fmu20. To build a 64-bit FMU, append option -win64 to the build command. For Linux and Mac OS X get inspired by all target inside FMUSDK_HOME\fmu10\src\models\makefile and FMUSDK_HOME\fmu20\src\models\makefile. The figure below might help to create or process the XML file modelDescription.xml. It shows all XML elements (without attributes) used in the schema files (XSD) for model exchange and co-simulation 1.0. 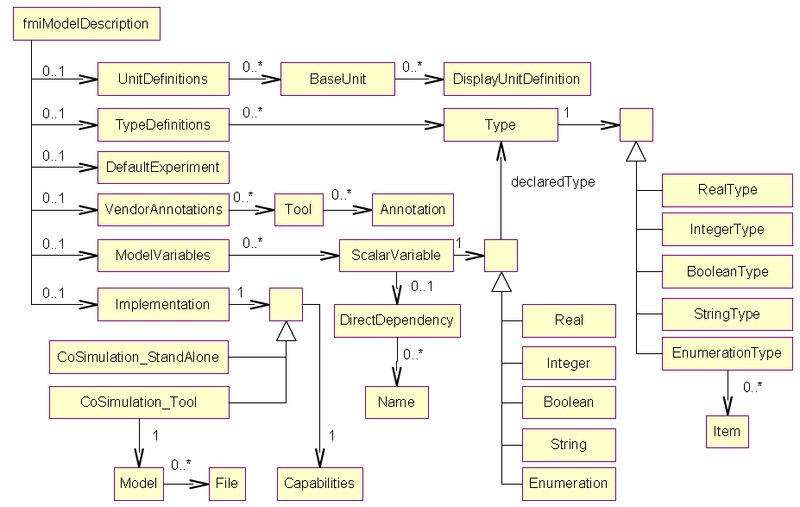 Notation: UML class diagram. For the case of FMU 2.0, see the corresponding overview figure in the FMI specification 2.0. Copyright � 2008-2018, QTronic GmbH. All rights reserved.